Posted in: Public Outreach. 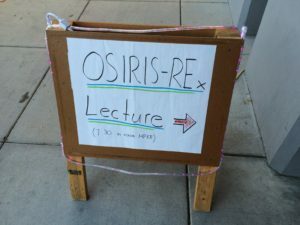 Tagged: osiris rex, star-gazing event. The weather was up and down all day yesterday, but by the evening, the scattered clouds had completely disappeared, giving us a warm, clear to talk about the OSIRIS-REx mission and do some star-gazing. The evening started off with a brilliant presentation from Alessondra Springmann, LPL grad student and scientist on the mission. I’ve included a youtube video of her presentation below. After the talk, we looked at the Moon, Mars, and Saturn through the Physics Dept.‘s telescopes. Thanks especially to our student volunteers. This wonderful event would not have been possible without their help.